Photo Baby Birth Announcements, Custom Photo Birth Announcements ! "We found out about your website when we received a photo birth announcement from a couple who ordered it from you. We were so impressed with their birth announcement that we just knew we had to use you for the birth of our son. As expected, we were very, very happy with the results!" - Gina, Mark and Jason. "Thank you so much for the great job you did on our photo birth announcements. We are beyond thrilled with how beautiful they turned out." "I had the hardest time decided between all your super cute designs, but have to say I am very satified the photo birth announcements we ordered from you. I am very impressed with the quality and can't say enough about your great customer service. Thank you! " - Liv H.
Share the happy news of the arrival of your brand new baby with our unique, one of a kind photo birth announcements. All of our photo birth announcements use multiple photos of your precious newborn, so you don't have to settle on that one perfect photo. Our artists have created original designs for our photo baby birth announcements that you won't find anywhere else, and will work with you to create the perfect announcement to show off your beautiful baby. These personalized photo birth announcement cards are stunning, archival quality, real photographs, with accompanying envelopes, and guaranteed to make you smile! Filmstrip Photo Birth Announcements © Send us 4 of your favorite photos with your message and personalization. Also available with hearts background - see sample on our wedding save the date page. New 5-Photos Photo Birth Announcements ©Send us 5 of your favorite photos with your message and personalization. (Please indicate which photo you want to use to use for the large, featured photo). Background colors available: pink (shown) and blue. Scrapbook Page Photo Birth Announcements ©Send us 3 of your favorite photos with your message and personalization. Also available in shades of blue. Baby Hearts Photo Birth Announcements ©Send us 3 of your favorite photos with your message and personalization. Baby Bubbles Photo Birth Announcements ©Send us 3 of your favorite photos with your message and personalization. Teddy Bears Photo Birth Announcements ©Send us 2 of your favorite photos with your message and personalization. New 5 x 7 inch photo birth announcements. The entire photo card is a genuine photograph, a non-folding card with the photos, design and message professionally printed on glossy heavyweight (10.5 ml thick) photo paper. Guaranteed to have the same superior quality, and even longer lasting archival characteristics as your regular, traditional photos. Messages on above baby birth announcements photo cards are only suggestions. You may change the wording to create your own, personal message. Look at the sample text used in the card of your choice as a guideline to how much text can be used. 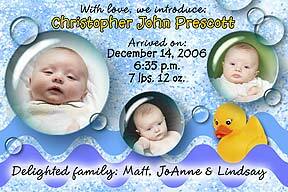 Most of the birth announcement designs can be changed into photo christening or baptism invitation or announcement. Just let us know what you'd like your photo cards to say, and in most cases, we can adapt the design for your needs. Envelopes: Each photo card comes with a white envelope. The envelopes for your 4 x 6 cards measure 4 1/8 x 6 1/8 inches. The envelopes for your 5 x 7 cards are 5 1/4 x 7 1/4 inches. We always include extra envelopes with your order. We do not have other envelope colors available at this time. We will email you a confirmation that we received your photos within 1 business day. If you do not receive this confirmation, please resend your photos, as we may not have received them. Double check your spam folder, to make sure the confirmation email isn't there, before resubmitting. If you still haven't heard from us, please call us for help. We always email you a proof of your photo birth announcements order within a couple of business days of receipt of your emailed photos and order information. This is so that you may check it for accuracy, and we only send your order to production after we have received your approval. Please check your email often for your proof to avoid unnecessary delays. If you have not received your proof within 2 days, please contact us and we will resend it. Minimum order is 25, but you can order any amount after that. 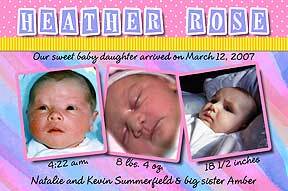 Many photo birth announcement companies force you to order in packs of 25, (25, 50, 75, etc.) but you can order from us 38 or 52 or 112 - or whatever is exactly the amount you actually need. Sample of a past baby birth announcement photo card order can be obtained if you send us $3. We will mail your specified design sample and size choice (4 x 6 or 5 x 7), along with a coupon for $3 off, if you decide to order. All photos must be emailed to us at PhotoPartyFavors@aol.com. We no longer accept photos that are sent to us by regular mail for Photo Cards. Photo baby birth announcement magnets, as well as photo birth announcement bookmarks are also available. We also have photo bookmarks as baby shower favors. If you are looking for a young child's birthday favors, please consider our popular kid's birthday magnets. We also have photo christening bookmarks and photo christening magnets that can be adapted to baptisms and dedications. 4 x 6 inch $1.99 ea. $1.75 ea. $1.50 ea. $1.29 ea. $1.25 ea. 5 x 7 inch $2.99 ea. $2.75 ea. $2.50 ea. $2.25 ea. $2.19 ea. EMAIL your high resolution jpg photos to PhotoPartyFavors@aol.com. When emailing more than one photo for photo birth announcements, you may email them together, or in separate emails. When emailing them separately, please make sure you list your name and what you are ordering with each photo. Please include your name, shipping address, phone number (in case we have any questions), what you're ordering, how many, the last possible date you need it by, the personalization desired, and confirmation that you have mailed (or will be mailing within the next 24-48 hours) your check made payable to Linda Kling. If you are scanning photos to email to us, please wipe the dust off your scanner and photo first. Make sure your photos are scanned at a minimum of 4 x 6 inches at 300 dpi and saved at the highest quality, lowest compression jpg. If choosing the 5 x 7 inch photo card size, please make sure you scan at 400 - 600 dpi. If someone scans a photo for you, please ask them to scan it at full size at 300 dpi. (or 400 - 600 dpi for 5 x 7 size cards). If you don't know how to make sure your scanner is set to scan at 300 dpi, then click on the help file in your scanner software for instructions. Do not scan the entire scanning bed, but just the photo. Don't send us your photo as an image within a document (such as Word, WordPerfect, PowerPoint etc. ), or as a pdf file, but only as a jpg image file. Any questions or comments? Send us an e-mail at PhotoPartyFavors@aol.com. You can also check our FAQ page for answers to common questions.